Working as a search consultant, I often feel more like a doctor than a marketer. Each interaction generally starts out the same way: make an introduction, ask the client where it hurts, run tests to determine what is really going on, then provide recommendations and support in order fix the problem. While the recommendations are client dependent, the initial discovery and reporting process are always the same. I use this outline for site migrations, but it also applies to general checking overall website health, especially the reporting section. Often, clients’ complaints regarding a website are very general. Traffic dropped, conversions are down, we screwed up the migration, make sure we don’t screw up the migration, etc. That is perfectly okay; recognizing a problem and seeking help is the right course of action. But whether you’re an in-house SEO or a consultant, not asking the right questions could have you looking in all the wrong places. Every interview should have a combination of open ended questions that lead to specifics about where the pain is being felt and the situation that lead up to that problem. Start by asking about what prompted this work. Once you get them talking you’ll be able to pick out things they bring up in conversation to dig deeper on. The Decision to Migrate. Ask about why they have decided to migrate the site. Often it’s to refresh the look and to meet current web standards. If that is the case, make sure you understand the priorities of the new site, both from a business standpoint and organic search standpoint. The Redirection Process. What was/will be the process of redirecting the old site to the new site look like? Are you changing servers? Will redirects be a 1:1 csv file or will they be implemented with Regular Expressions? Site Architecture. Will URLs and/or site architecture change during the transition? Are directories moving? Did the site start using or stop using query parameters? Did any content move from, or to, a subdomain? Website Goals. What are the 3 primary goals of the site and their metrics of success? Valuable Assets. What do you consider or know to be your most valuable pages on the site? This is an important one when migrating content. Guarding top organic and top converting pages is paramount. Page Layout. Has/will the layout of the website be changing? If so, does the layout affect the positioning of elements that drive the top 3 conversions? Qualified Keywords. What terms and phrases do they think qualify users the best? This goes hand-in-hand with the top pages and content change questions. If there will/have been changes to be changes to the content, this may need to be watched closely. 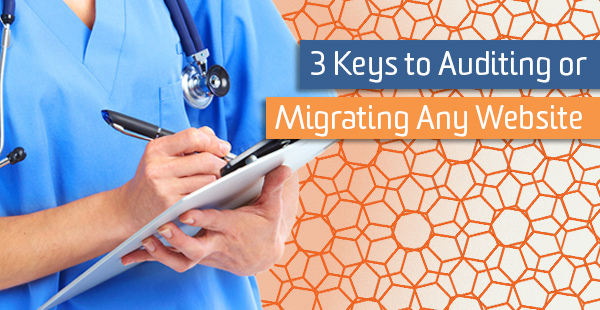 A migration audit is slightly different than a traditional SEO audit. If everything is done correctly, you should see no change in the amount of traffic coming to the site. I’m sure I’ll get some disagreement for saying that, but it’s true. Plan for the worst, cover your bases, and focus on traditional optimization post-transition. This is the “run tests” portion of the doctors visit. Setting up a website crawl properly will allow you to take inventory of the entire website in one shot and will save you a lot of time. We use Screaming Frog to crawl websites. Setup Custom Filters. Custom filters can help you create a list of URLs if they contain or do not contain certain elements. Screaming Frog custom filters use Regex, so be wary of characters like ?, ., or + that have a different meaning and can throw off your crawl. Setup Include/Exclude. This also allows you to use Regex to tailor what portions of the website are crawled. Get an export from the website database of pages before and after transition. A full Screaming Frog crawl for the entire website can be great for discovering issues with the site. But it also opens your scope to things that may not matter so much in a transition. Getting an export from the client will allow you to know specifically what pages are unique. You can then generate a redirect map from that list, use a general crawl of the website to canonical duplicate URLs, and/or use it to cross check a post-transition website. It’s easy to get carried away with collecting benchmark data. I follow a single rule of thumb: if I won’t have access to the number of information after the transition, then I capture that data now so that I have it post-transition. Structured Data – Types and total items. Links to your site – Total number of links, who links most, your most linked to content, how your data is linked. Everything else in Google Search Console comes with a graph which will allow you to compare metrics retroactively, so there is no need to waste time capturing them now. I would also recommend you follow this strategy using Moz’s Open Site Explorer. I always start my analysis by adding my crawl data to my Screaming Frog analysis spreadsheet which will give a visual snapshot of the sites inventory. Then I dig deeper into any technical issues I believe should be fixed before the transition. Fixing 404 URLs is always something good to during a migration, as is making sure your files like robots.txt and sitemap.xml are up to date. Analytics reporting is essential to being able to quickly identify what matters most during a transition. I produce three custom reports in Google Analytics which I can then share with clients and members of my team. Each report contains three tabs – source/medium, device, and landing page – and they contain the following metrics: sessions, bounce rate, avg. time on page, pages/session, plus any relevant goals. I like to create one report with separate tabs, specifying the dimensions and metrics of each. I then duplicate that report and change the filters so all of my reports look similar. Your filter will apply across all tabs in your custom report. I’ve linked to 4 Custom Reports below. Add these reports to your View with production level data, and use the date compare feature to look a period of time before the migration and after the migration. Look for large shifts or drastic changes that may have been caused by the new site launch. In general, let’s take a look at all of the traffic coming to your site. Do you see any major issues by particular device or on particular landing pages? How has Organic Traffic been affected by your site launch/design? This report has already been narrowed to only show Organic Search traffic with the following filter. This report will help you keep track of specific pages that you really care about. Adjust the filters to include a regex of just the top landing pages you want to monitor. This report will help you keep track of Organic traffic that lands on 404 pages to see how they go up or down after a transition. You should be already tracking your 404 page in Google Analytics, this just helps sum them up into a handy report. You’ll need to adjust the filters to include your specific 404 pages.